The only thing warmer than a layer of gentlemen's mink in the bitter cold is a double old-fashioned of absinthe—for centuries the magic sauce of choice for philosophers, poets and lovers like Pythagoras. Its historic significance pales only in comparison to its effect on your psyche, so it's high time you picked up an absinthe habit of your own. Like so many of the very best goods, you cannot purchase absinthe in the U.S.—you have to import it. Although homemade absinthe can be as enjoyable to make as to drink, Hemingway purchased; so you will purchase. We recommend either a Swiss-based Kubler or La Bleue from suppliers Alandia or Jade Liqueurs. 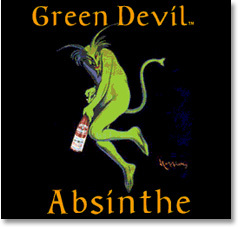 Before you engage, know this: the word absinthe derives from the Greek absinthion, or "undrinkable." This description will inevitably be accurate through your first two sips of the green-hued goodness, no matter how good your prep skills. But those who get past the initial shock will be rewarded with tastes of black licorice and the same virtuosic properties that made it Hippocrates's go-to treatment for jaundice and rheumatism. Really, though, don't feel bad using the 130-plus proof beverage to hallucinate and stay warm.